This book brings the world of reptiles to life with eye-catching photos and captivating information about turtles, snakes, lizards, crocodiles, and their scaly-skinned kin. 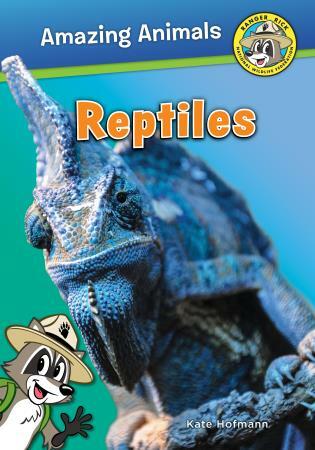 Readers will learn how reptiles survive in many habitats, from hot deserts to tropical forests and even under the sea. They’ll get an up-close look at reptiles’ amazing senses, tricky defenses, and wide variety of strategies for moving around, catching and eating food, and bearing young. Strategies for getting and eating food – some reptiles eat plants (turtles, iguanas), others eat meat. Hunters use many different strategies, including constriction (boas) and venom (many other snakes, gila monster, komodo dragon). Chameleon shoots its long tongue out to catch prey . The egg-eating snake unhinges its jaw to swallow eggs. Adaptations for different habitats – dealing with extreme heat and lack of water (scaly skin keeps water in, thorny devil collects water from dew with grooves on its spikes). Others are adapted for freshwater or marine life, or for life in the trees. Amazing moves – geckos’ ability to grip with their feet, “flying” geckos and snakes, basilisk lizard that runs on water. Reproduction – most reptiles lay eggs, a few bear live young; most don’t take care of offspring but some do guard eggs or young. Temperature of eggs, rather than genetics, determines whether offspring are male or female. Conservation – threats, endangered species, and a few examples of how people are helping to protect reptiles. Invitations to explore – sidebars throughout give readers tips for investigating reptiles where they live. Kate Hofmann is a contributor to Ranger Rick Magazine.